Spotted fever group (SFG) rickettsiae cause infection in humans, domestic animals and wildlife. To date, no rickettsial agents have been reported in hard ticks from the long-tailed ground squirrel (Spermophilus undulatus). A total of 50 adult ticks and 48 nymphs were collected from S. undulatus in the border region of northwestern China. 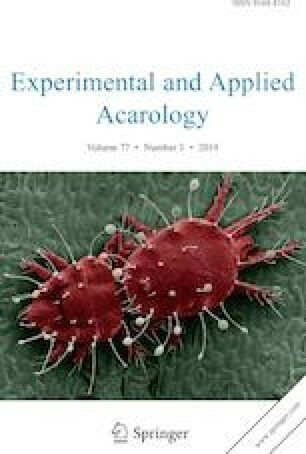 Tick species (identified according to morphological and molecular characteristics) included Dermacentor nuttalli, Dermacentor silvarum and Ixodes kaiseri. Based on the cytochrome c oxidase subunit I (COI) haplotype analysis, I. kaiseri from S. undulatus belongs to an ancestral. In addition, all tick samples were analyzed for the presence of rickettsiae by PCR amplification and sequencing of six genetic markers. Rickettsia raoultii and Rickettsia sibirica subsp. sibirica were shown to occur in adults and nymphs of D. nuttalli and D. silvarum. Rickettsia sibirica subsp. sibirica was also detected in an I. kaiseri adult. Dermacentor silvarum and I. kaiseri were found for the first time on S. undulatus. Rickettsia raoultii and R. sibirica subsp. sibirica were detected in two Dermacentor and one Ixodes species, respectively, suggesting that these rickettsiae circulate in the region of the China-Kazakhstan border by hard ticks infesting S. undulatus. Shuo Zhao, Meihua Yang, and Mengmeng Jiang contributed equally to this work. The online version of this article ( https://doi.org/10.1007/s10493-019-00349-5) contains supplementary material, which is available to authorized users. The long-tailed ground squirrel (Spermophilus undulatus) has been listed as globally vulnerable by the International Union for Conservation of Nature (IUCN) since 2008 (Ramoslara et al. 2014). This species is mainly distributed in Kazakhstan, Mongolia, Russia and northern China including Heilongjiang, Inner Mongolia and Xinjiang Uygur Autonomous Region (XUAR) (ZipcodeDev Team 2018). According to previous reports, S. undulatus and its ectoparasites are reservoirs of Yersinia pestis, Francisella tularensis and tick-borne encephalitis virus (Zhao et al. 2017; Wang and Yang 1983; Demina et al. 2017). However, only few tick species (i.e., Dermacentor marginatus, Dermacentor nuttalli, Rhipicephalus schulzei and Ixodes persulcatus (Wang and Yang 1983; Demina et al. 2017)) are known to infest S. undulatus. Members of the tick subgenus Pholeoixodes prefer burrowing mammals as hosts (Hornok et al. 2017), thus can be expected to occur on S. undulatus. Nevertheless, no previous reports confirmed this. 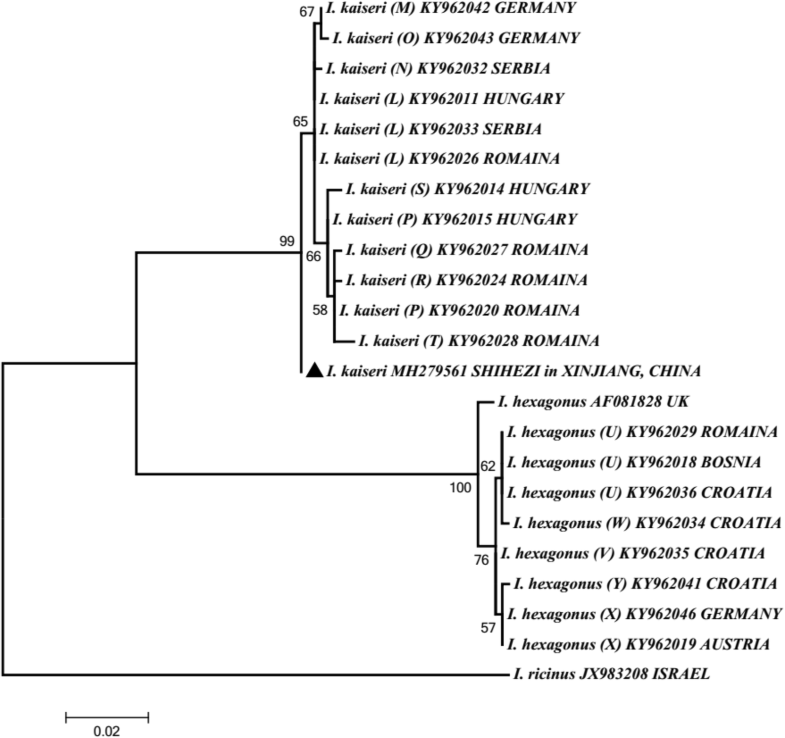 In a study comparing three species of this subgenus (Ixodes kaiseri, Ixodes hexagonus and Ixodes canisuga) the 16S rDNA phylogenetic tree reflected that I. kaiseri is divided into at least nine COI haplotypes in Europe (Hornok et al. 2017). However, at that time no specimens of I. kaiseri were available from Asia for comparison. Spotted fever group (SFG) rickettsiae cause infection in humans, domestic animals and wildlife (Maina et al. 2014). At least nine Rickettsia spp. of the SFG had been detected in XUAR (LopezVelez et al. 2015; Guo 2017). According to previous studies, Rickettsia sibirica subsp. sibirica, responsible for Siberian tick typhus, is widely distributed in China, Mongolia, Kazakhstan and Russia, and was also molecularly detected in Spain (Guo 2017; Parola et al. 2013; Byambaa et al. 2008; Palomar et al. 2012). Rickettsia raoultii, the causative agent of tick-borne lymphadenopathy (TIBOLA) or Dermacentor-borne necrosis erythema lymphadenopathy (DEBONEL) (Mediannikov et al. 2008), is prevalent in Mongolia, Europe and the Russian Federation (Oteo and Portillo 2012; Boldbaatar et al. 2017). These examples justify the importance of studying rickettsiae with broad distribution range in Eurasia. Therefore, the aim of this study was to identify ticks infesting S. undulatus, and to molecularly identify Rickettsia species in these ticks. A total of 36 S. undulates were captured in Jinghe County (2023 m above sea level; 44°35′59N, 82°53′28E), near the wetlands around Ebinur Lake, in the Northwest region of XUAR in July 2017. For this purpose, Sherman traps (H.B. Sherman Traps, Tallahassee, FL, USA) were used, which were placed at the entrances of occupied burrows (Torres-Perez et al. 2010). Each survey site included 150 traps that were checked twice a day. Each trap was removed before nightfall and replaced on the survey site the following day. Ticks were sampled from the entire body of each S. undulatus, and were first identified with stereomicroscope (LEICA M165 C) according to standard morphological keys (Hornok et al. 2017). Then the genomic DNA was extracted from all ticks by using the 96 flux automatic nucleic acid extraction instrument with a matching commercial kit (Cell & Tissue Kit, Bioteke, Beijing, China) according to our previous report (Liu et al. 2018). To confirm the morphological identification of tick species, two mitochondrial markers, the 16S rDNA and the cytochrome c oxidase subunit I (COI) genes (Hornok et al. 2017), were analyzed according to five representative ticks for each tick species. The phylogenic relationships among the representative tick specimens were inferred using MEGA 6.0 software. Twelve nucleotide sequences from our study have been deposited in the GenBank database (16S rDNA: MG656445, MH324406-MH324409; and COI: MH079424, MH279561). Six genetic markers, including 17-kilodalton antigen (17-kDa), surface cell antigen 4 (sca4), citrate synthase (gltA), cell surface antigen 1 (sca1), and outer membrane proteins A and B (ompA and ompB), were amplified from each sample to investigate the presence of SFG rickettsiae (Anstead and Chilton 2013a, b). The primers and PCR cycling conditions in this study are shown in Supplement Appendix Table 1. Each PCR assay included a negative control (distilled water instead of tick DNA template) and a positive control (with DNA from R. raoultii obtained from wetlands of Ebinur Lake in XUAR). Purification and sequencing of the PCR products were done as described above (Anstead and Chilton 2013a, b). Phylogenetic trees were constructed using the maximum-likelihood and neighbor-joining methods in MEGA 6.0 software (Guo et al. 2015). A total of 98 ticks (50 adult ticks and 48 nymphs) were collected from captured S. undulatus. 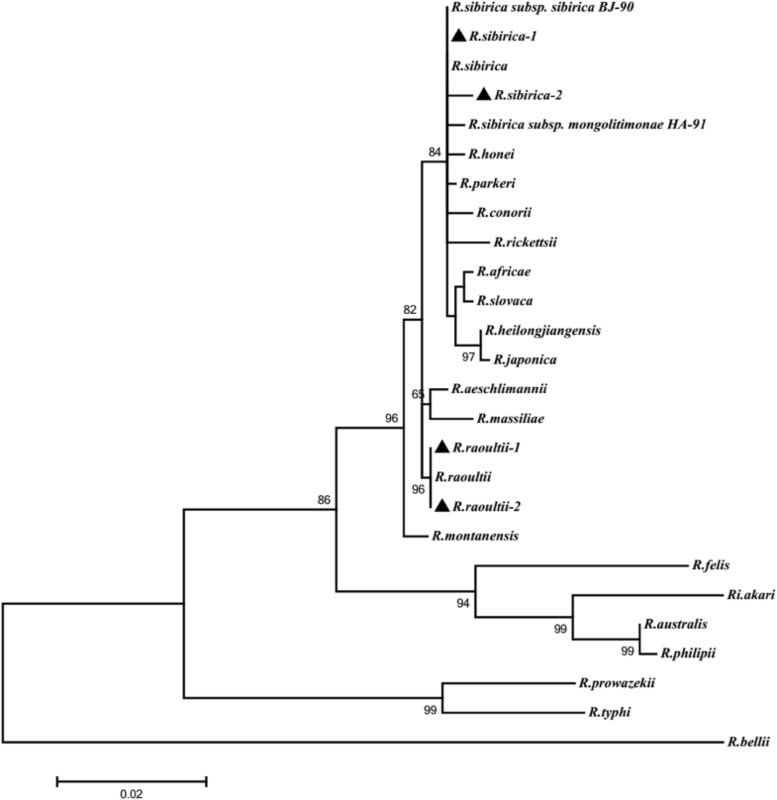 According to morphological characters and the 16S rDNA phylogenetic tree, ticks in this study were identified as D. nuttalli, D. silvarum and I. kaiseri (shown in Fig. 1). Based on analysis of COI haplotype, 1-5 nucleotide differences were found in comparison with I. kaiseri from Europe. The phylogenetic analysis indicated that I. kaiseri from S. undulatus was in an ancestral position to nine European haplotypes (“L to T”) (Hornok et al. 2017) (shown in Fig. 2). Phylogenetic tree based on the COI gene, including sequences obtained in this study and representative sequences of other Ixodes spp. Out of 50 adult ticks (26 D. nuttalli, 21 D. silvarum and 3 I. kaiseri) and 48 nymphs (27 D. nuttalli, 21 D. silvarum), 25 adults and 16 nymphs were positive for six Rickettsia genetic markers (17-kDa, gltA, ompA, sca1, sca4 and ompB). Among them, R. sibirica subsp. sibirica was found in nineteen D. nuttalli (8 nymphs and 11 adult ticks), 13 D. silvarum (6 nymphs and 7 adult ticks) and an adult I. kaiseri. In addition, R. raoultii was found in five D. nuttalli (one nymph and four adult ticks), three D. silvarum (one nymph and two adult ticks) (shown in Fig. 3; Table 1). 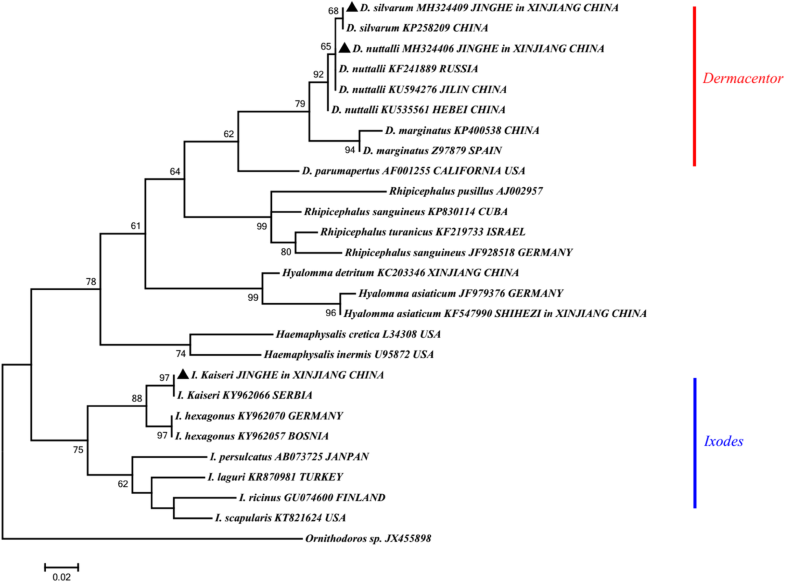 As indicated by five genetic markers (17-kDa, gltA, sca1, sca4 and ompB), R. sibirica subsp. sibirica in this study had sequence similarities in the range of 98.7–100% when compared to R. sibirica from D. nuttalli infesting sheep in Jimunai County, XUAR (Guo 2017). In addition, R. raoultii had 99.1–100% similarity compared to R. raoultii strain Khabarovsk (CP010969). The detailed similarities and divergences of the sequences from this study are shown in the Supplement Appendix Table 2. Spermophilus undulatus is a burrowing mammalian species, inhabiting mountain areas 1600–3000 m above sea level (a.s.l), with habitats along wetter front hills, forest margins and river valleys (Wang and Yang 1983). Previously, D. marginatus, D. nuttalli, Rh. schulzei and Ixodes persucatus were sampled from S. undulatus (Wang and Yang 1983). Dermacentor silvarum, a three-host tick species, is widely distributed in North China, Russia and Mongolia (Deng and Jiang 1991; Kulik and Vinokurova 1983). The adult ticks parasitize cattle, horses, sheep, goats, hares and hedgehogs, and the larvae and nymphs mainly infest voles, squirrels and birds (Wang and Yang 1983). On the other hand, I. kaiseri occurs in the western Palearctic, including Germany, Hungary, southern Moldavia, Ukraine, Crimea, Romania, Egypt, Israel, Azerbaijan and Georgia, where it typically infests badgers, foxes, steppe polecats, raccoon dogs, common hedgehogs and domestic dogs (ZipcodeDev Team 2018; Hornok et al. 2017). In the present study, adult ticks (D. nuttalli, D. silvarum and I. kaiseri) and nymphs (D. nuttalli and D. silvarum) were found on S. undulatus in northwestern China. Our results extend the host range of D. silvarum and I. kaiseri. The ancestral phylogenetic position of its COI haplotype from China supports that the genetic diversity of I. kaiseri might be related to various geographic locations (Hornok et al. 2017). To date, R. sibirica, including R. sibirica subsp. sibirica and R. sibirica subsp. mongolotimonae, have been reported from Hyalomma anatolicum, Hyalomma truncatum, Hy. asiaticum, Rh. pusillus, Dermacentor sinicus, D. nuttalli, D. marginatus, D. reticulatus, D. silvarum, Haemaphysalis yeni, Haemaphysalis concinna and I. persulcatus (Parola et al. 2013). In XUAR, R. sibrica subsp. sibirica has already been isolated from D. nuttalli in Jinghe County in 1974 (Kong et al. 1982). However, our finding is the first molecular evidence on the presence of R. sibirica subsp. sibirica in I. kaiseri from S. undulatus. Another Rickettsia species, R. raoultii, is highly prevalent in XUAR and its neighboring countries. Among the others, it was detected in Haemaphysalis erinacei from marbled polecats in the Ebinur Lake wetlands (189 m above sea level; 82°48′51E 45°04′22N) in northwest China in 2014 (Anstead and Chilton 2013a, b). Jinghe County, neighboring Ebinur Lake wetlands, has a similar geographic habitat. In the present study, R. raoultii was detected in D. nuttalli and D. silvarum from S. undulatus. These findings suggest that D. nuttalli, D. silvarum and I. kaiseri parasitizing S. undulatus may serve as reservoirs and carriers for R. raoultii and R. sibirica. Jinghe County, with the largest density of S. undulatus in China (10–50/hectare), was listed as a main Marmot baibacina–S. undulatus plague focus since 1967 (Wang and Yang 1983). Yersinia pestis was isolated from 3.22% (66/2051) of S. undulatus (Zhang and Sheng 1991). In our current study, the rickettsial 17-kDa gene was detected from two naturally killed S. undulatus (data not shown). These findings indicate that several vector-borne pathogens co-circulate in Jinghe County, and imply potential risks associated with populations of S. undulatus. In the future, it is necessary to confirm whether D. nuttalli, D. silvarum and I. kaiseri infesting S. undulatus could serve as vectors, transmitting rickettsial agents to S. undulatus. Dermacentor nuttalli, D. silvarum and I. kaiseri were sampled from S. undulatus near the China-Kazakhstan border, and I. kaiseri in this study had an ancestral COI haplotype when compared to conspecific European sequences. Rickettsia raoultii was detected in the adult and nymph stages of D. nuttalli and D. silvarum, and R. sibirica also in one I. kaiseri adult. These findings extend our knowledge on the range of tick species infesting S. undulatus and harboring rickettsial agents. The authors are grateful to Dr. Jinliang Sheng (College of Animal Science and Technology) for capturing Spermophilus undulatus. SZ, MY, MJ and YW conceived and designed the study. 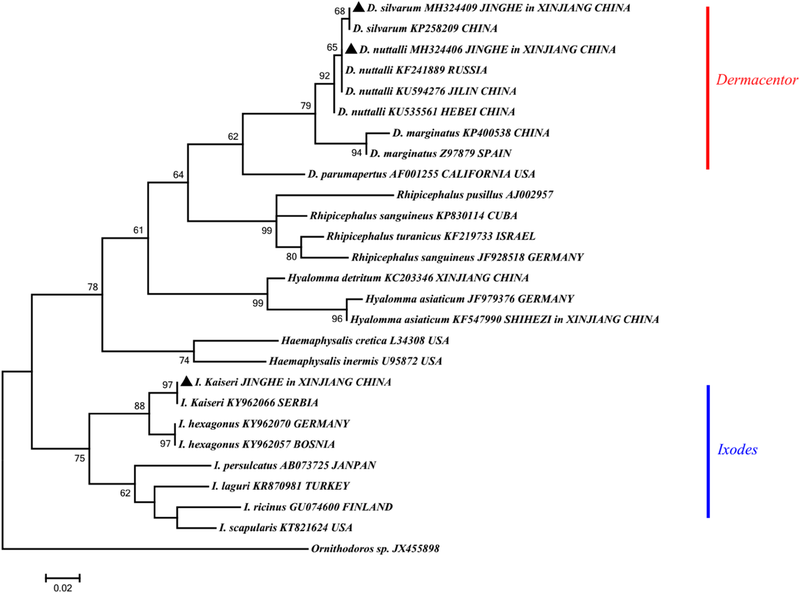 BY, SZ, WY, BW and WH processed the samples and performed molecular and phylogenetic analyses. SZ and SH contributed to writing the manuscript. All authors read and approved the final version of the manuscript. This research was supported in part by the National Key Research and Development Program of China (2018ZX10101002-002-007 and 2017ZX10304402-002-005), National Natural Science Foundation of China (81560338 and U1503283), and International Scientific and Technological Cooperation in Bingtuan (2016AH001). This study was approved by the Animal Ethics Committee of Shihezi University (Approval No. AECSU2017-22).